LAWRENCE — The new exhibition “Art in the Grove” enlivens the historic green space at the heart of the University of Kansas’ Lawrence campus through two site-specific works commissioned by the Spencer Museum of Art. The first commissioned work is a series of benches installed within Marvin Grove and in front of the Spencer Museum created by local artist team Judith G. Levy, Jason Zeh and David Ross. Each bench wraps around or “hugs” a tree. Titled “CHIPKO,” the Hindi word for hugging, the installation was inspired by women who — in 1973 — hugged trees to prevent them from being cut down by loggers in the northern state of Uttar Pradesh, India. The benches feature glow-in-the-dark paint to artificially mimic the relationship the trees have with sunlight. Two of the benches also include audio, which was created using natural sounds collected from the Grove. The second commissioned work is a dance performance choreographed by Maya Tillman-Rayton, an instructor in the Department of Theatre & Dance. Rayton’s performance, titled “Groove in the Grove,” uses the grounded movement from hip-hop and modern dance to celebrate the wooded landscape. “Groove in the Grove” will be performed by dancers from KU and the Lawrence community at the Spencer Museum's annual Backyard Bash in Marvin Grove on Sept. 30, with an open rehearsal Sept. 27. Tillman-Rayton said she was excited to participate in the exhibition because dance is often presented separately from visual art. “‘Groove in the Grove’ will create a moving sculpture using hip-hop dance with the sounds of funk music. This piece should be fun, festive and encourage the crowd to move,” Tillman-Rayton said. “Art in the Grove” is also a site for Open Spaces: The Expanded Field. Open Spaces is a 10-week, city-wide celebration of art and artists throughout the Kansas City area. “Art in the Grove” is supported by Mike and Dee Michaelis, Emprise Bank and the Linda Inman Bailey Exhibitions Fund. Kick back with your friends and neighbors in the biggest backyard on campus — historic Marvin Grove behind the Spencer Museum of Art — for an artful celebration of our surroundings. Free and fun for all ages. Gain insights into "Art in the Grove" with Museum Director Saralyn Reece Hardy and the artists behind a series of new works nestled within historic Marvin Grove. 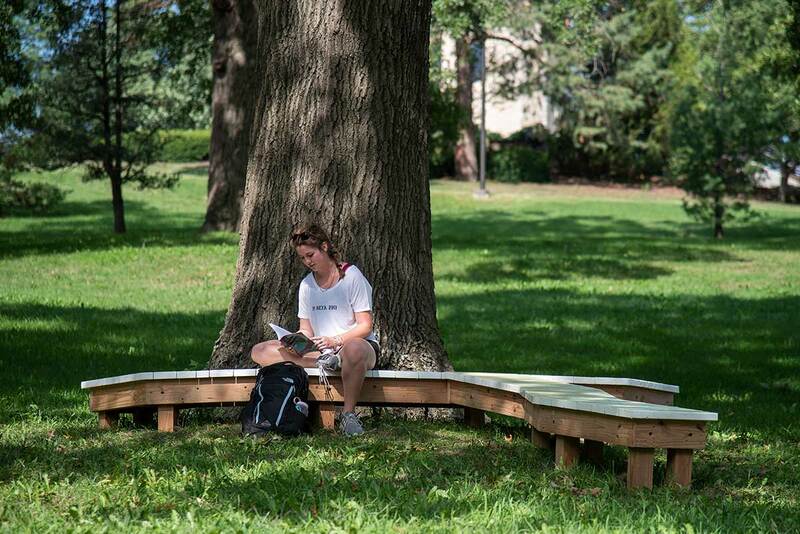 Photo: A student enjoys one of the benches installed within Marvin Grove as part of “Art in the Grove.” Credit: Ryan Waggoner, Spencer Museum of Art.